United Irelander: Well done, Padraig! Congratulations to Padraig Harrington on a superb Open victory today at Carnoustie. 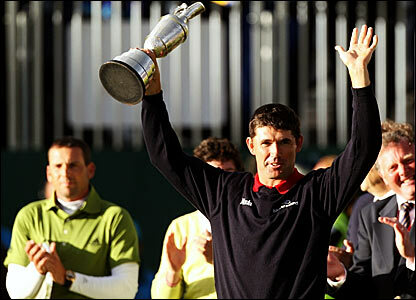 Harrington manged to edge out Spain's Sergio Garcia in a four-hole play-off to clinch his first ever Major title. A European hasn't won it in eight years and an Irishman hasn't won it since Fred Daily in 1947. "Obviously I've come a long way. When I turned pro I'd have settled for being a good journeyman golfer. "It's been great being named as someone who could win a major but that brings its own pressure. "I'm sure there's a hell of a party (in Ireland) now and I know I don't have anything to do for two-and-a-half days so I'm going to party on." It capped off a fine day for Irish golf as County Down's Rory McIlroy picked up the silver medal for being best amateur. I'm delighted for Padraig as I know he's had many doubters who wondered if he could ever land the big one. You can watch him being interviewed here following his win and you can see how much it meant to him. Enjoy your moment, Padraig. Irish sportsman of the year? He looks a good bet to me even at this relatively early stage.